Buy Natures Aid Omega 7 Sea Buckthorn 500mg - 60 softgels in the UK from our online shop or directly from our independent Scottish store. Sea Buckthorn is an important source of Omega-7 (Palmitoleic Acid). 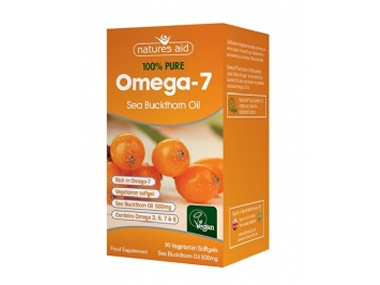 Natures Aid Sea Buckthorn Oil 500mg softgels contain 300mg of Omega-7 per daily serving. Sea Buckthorn Oil is also a natural source of carotenoids, vitamins and Omega-3, 6 & 9. Natures Aid Sea Buckthorn Oil softgels are suitable for vegetarians & vegans. Sea Buckthorn Oil, Vegetable Gelatin (Corn Starch, Carrageenan), Glycerine. Take 2 softgels per day with food. Do not exceed the recommended intake. Where can you buy real Omega 7 Sea Buckthorn 60's safely online? If you are wondering where you can buy Natures Aid Omega 7 Sea Buckthorn 500mg - 60 softgels safely online in the UK, then shop with us. Omega 7 Sea Buckthorn 60's - Natures Aid Omega 7 Sea Buckthorn 500mg - 60 softgels in Fatty Acids & Omega and Herbal Remedies, Tinctures & Supplements.